Hryvnia (spelling ‘grivna’) – is an official currency of Ukraine since 1996. 1 Hrn = 100 ‘copiyok’ (‘copiyka’ is a national coin). The currency is issued by the National Bank of Ukraine. This institution takes function of the top regulator of the bank system in Ukraine. All official payments are charged and executed in the national currency solely. Do you plan on making a trip to Ukraine and would like to learn about the local money, and where to get it once you are here? In that case continue reading because we are about to answer your questions. CAN I USE EUROS OR US DOLLARS IN UKRAINE? The answer is yes, you can use euros, US dollars and even Russian roubles, but only to exchange them into Ukraine’s local currency for later use. That is, you will not be able to pay for your groceries, public transportation or a hotel room in any currency but Ukrainian hryvnia. Some private business might accept a payment in a foreign currency, but these instances are rare. The current rate of exchange of Ukraine's money to one US dollar (as of Jul. 2015) is roughly 1 to 24, although it's very volatile currently. That is, for 1 US dollar you will get 24 Ukrainian hryvnias. And the cost of 1 Euro is a bit more than 26 UAH. CAN I GET HRYVNIAS BEFORE BOARDING MY PLANE FOR UKRAINE? Unfortunately, I cannot give you the answer to that question as I don’t know the situation in every country of the world. But if you believe you need to have at least some hryvnias before you cross our border, I suggest that you visit your local bank to check if they have any. In my opinion, it all depends on where you are coming from, and how strong of a relationship that country has with ours. As an example, people visiting Ukraine from Russia should be able to exchange Russia’s rubles (also spelled as roubles) into Ukrainian hryvnias. Before I go into describing each option, let me just point out that exchanging money in Ukraine's international airports might not be optimal. The rate of exchange there is not as favorable as in a city (for your dollars or Euro you will get fewer hryvnias than you normally would if exchanging that same amount of money in a city. Nevertheless, there are situations when having at least some local cash is a necessity. Don't bring an American Express card. There is a chance you won’t be able to use it, anyways. Know your card's PIN - personal identification number. 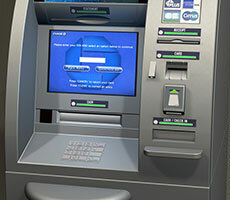 You will be asked to enter your PIN when using an ATM, as well as in a bank. 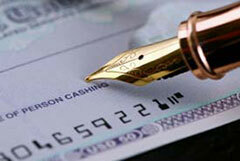 I have witnessed the process of exchanging travelers cheques only several times. Although possible, it may take some time depending on a bank you go, and its employees. From what I saw they make a copy of your check, as well as pages of your passport. In addition, a commission is charged for the whole operation. Time-wise, it took my client approximately 20 minutes to exchange his traveler’s checks in one bank. If you don’t mind waiting, bringing traveler’s checks to Ukraine might be one of your options. You can bring as much as 10,000 euros of undeclared cash to Ukraine (or its equivalent in your national currency). 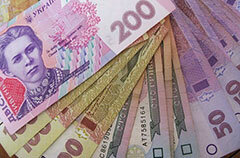 US Dollars and Euros are two widely accepted currencies that can easily be exchanged in any bank of Ukraine. Make sure your banknotes look as good as freshly cut leaves. I know it may sound nonsensical, but bank employees are unbelievably picky when it comes to the look of foreign banknotes. Make sure the bills you bring to our country don't have any stains or anything written on them. Some banks refuse the exchange of such banknotes while others, may charge you a 5 percent commission. Have your passport ready (the driver's license most likely won’t be enough). Make sure you count the money in front of the cashier before you leave. The cashier should provide you with a 377 form. Don't throw it in the trash bin. If you don’t spend all of the hryvnias by the time you need to leave Ukraine, you might want to make a reverse currency exchange. The later will not be possible unless you provide the bank with the 377 form you were given. This form might only be valid in the bank who issued it. It is time for the final tip: don't use services of local street vendors to exchange money. This is illegal and may get you in trouble. From what I have heard, these people are notorious for being cheats (crooks). There are definitely some exceptions to the rule, and their rate of exchange is usually better than that of a bank. I hope this article answers most of the questions one might have about getting hryvnias in Ukraine. If not, please send me an email so I can provide you with more helpful information. Financial fraud is a common risk for foreigners in Ukraine, so to be aware, have a look on some recommendations from our professional Expert and some useful tips in Scams section. More advice from expats may be also found on our Forum.